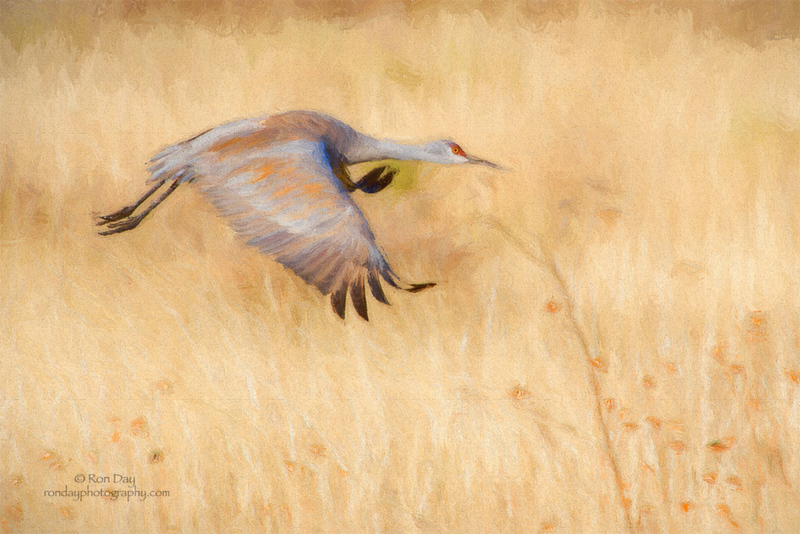 I photographed this Sandhill Crane at Bosque del Apache NWR, and I painted it using Topaz Impression II. Please click on image to view larger version. Thank you. Nikon FX, Nikkor 500mm + 1.4X, f/10 @ 1/1000, ISO 800, Gitzo Tripod with Wimberley Head II. Wow - love it, Ron. Beautifully done, Ron! I love the soft, warm colour palette and the pose, with downswept wings, of the elegant crane. This would grace any room. Gorgeous, Ron- the textures are so soft and subtle with lovely colors, and the paint work is so convincing -looks like a beautiful pastel painting. Definitely needs a click to see all the delicate details. All been said Ron. So beautiful and the subtle details are sublime. congrats! Thank you for the comments everyone, and thank you NSN for the EP. Great effect. The larger photo is beautiful. Congrats on the EP.